Help us to improve the health of the 7 million people in rural and remote Australia. The NRHA works to improve the health of the 7 million people of rural and remote Australia. Please help us continue this work. There is much more to be done. For our core work, we receive support from the Australian Government Department of Health, but we need your help to extend our activities. We welcome all donations. 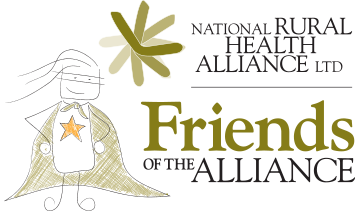 The NRHA is an ATO-registered, tax deductible health promotion charity. Donations will be put to use in our policy development and advocacy work and, unless you wish to remain anonymous, you will receive a Tax Invoice and Receipt of your financial support. All philanthropic donations from people like you will be used to promote better health and wellbeing for the people and communities of rural and remote Australia. To make your online donation, please click here If you'd like to make a donation over the phone, please call us on 02 6285 4660. As well, if you would like to support us on an ongoing basis, join Friends of the Alliance. Click here to become a Friend. More information about our work can be found on our About Us page.